Voted No.1 Laundry Brand for Sensitive Skin (online panel of 3347 females aged 18-70). Gentle Clean even in a Cold Wash. Dermatologically tested. Awarded with the Skin Health Alliance Seal. Cleans clothes brilliantly. Huggably soft for sensitive skin.Discover the power of gentle care in a cold wash with Fairy Non Bio Washing Liquid. 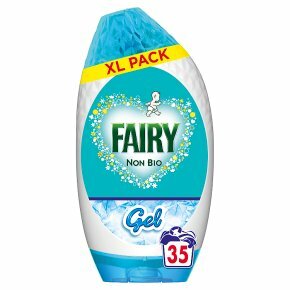 It is no surprise that Fairy Non Bio was voted no.1 laundry brand for sensitive skin. Fairy Non Bio leaves clothes brilliantly clean and feeling gentle next to precious skin even in a cold wash. Its viscuous formula makes Fairy Non Bio Gel easy to use - just pop the right amount in the attached dosing cap, and add that direct to the heart of your wash, so all those magical Fairy ingredients can get to work straight away. Use with Fairy Fabric Conditioner for the softest combination for your baby's skin. 38 washes based on 50ml per wash. *Online panel of 3347 females aged 18-70.